CAPE CANAVERAL — The opening volley in the transformation of U.S. weather forecasting was mounted atop its ride to space today for the planned Nov. 19 launch that begins an $11 billion upgrade in the nation’s meteorology capability. The Geostationary Operational Environmental Satellite-R, or GOES-R, was hoisted high atop its United Launch Alliance Atlas 5 rocket this morning at the vehicle’s Cape Canaveral vertical assembly building. At 11,500 pounds and equipped with advanced sensors, it is the heaviest and most sophisticated U.S. weather satellite in history, continuing a line of 16 previous GOES craft launched since 1975. “Space-based lightning detection and advanced imagery are among the new tools, which will help forecasters better monitor storm development and deliver more precise, timely and accurate watches and warnings,” said NOAA’s National Weather Service director Louis Uccellini. 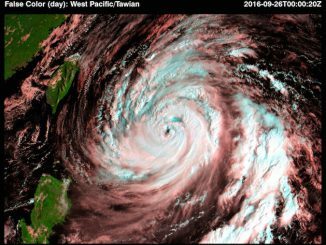 The heart of the spacecraft is the new imager that will produce substantially more embedded data on clouds and storms at higher resolution in faster refresh times than ever before. Hurricanes, for example, will be tracked at 30-second intervals. The craft also features the first-of-its-kind lightning mapper that will help in forecasting the intensity of storms, taking 200 images per second to observe cloud-to-cloud and cloud-to-ground strikes. “NOAA will now operate the most sophisticated technology ever flown in space to help forecast weather on Earth,” said Stephen Volz, assistant NOAA administrator for its Satellite and Information Service. Lockheed Martin built the GOES-R satellite, which is the first in a series of four observatories that will ensure U.S. weather monitoring into the 2030s. Getting the GOES-R craft 22,300 miles above the Earth to begin its mission starts with liftoff atop the Atlas 5 rocket on Nov. 19. A one-hour launch window at Cape Canaveral opens at 5:42 p.m. EST (2242 GMT). 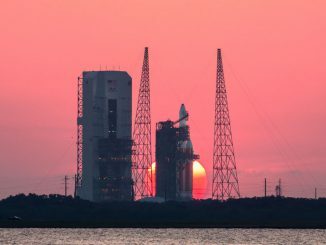 Should the liftoff slip to Nov. 20 for some reason, a one-hour window opening at 4:42 p.m. EST (2142 GMT) will be available. The window shortening is due to the FAA’s Holiday Airspace Release Program constraints. Fitted with four strap-on solid rocket boosters for added power, the rocket will perform a series of complex maneuvers to deliver the satellite into a customized high-perigee, lower-inclination geosynchronous transfer orbit dropoff point three-and-a-half hours after launch. 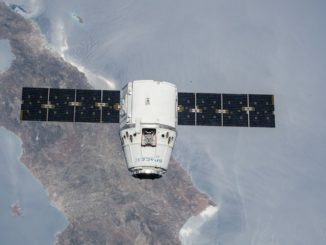 Once at its destination in geostationary orbit within two weeks, at the altitude that matches Earth’s rotation to stay in continuous lockstep with the Western Hemisphere, the satellite will begin a year-long checkout and demonstration of its new capabilities. Assembly of the Atlas 5 rocket began on Monday, Oct. 24 by erecting the first stage on its mobile launch platform. The rest of the week was spent attaching the solid-fuel boosters. The Centaur upper stage, which will fire three separate times during launch to shape the payload’s orbit, was installed on Monday, Oct. 31. Following initial testing last week, approval was given to bring the encapsulated satellite to Cape Canaveral’s Vertical Integration Facility from the commercial Astrotech payload processing facility in nearby Titusville early this morning. 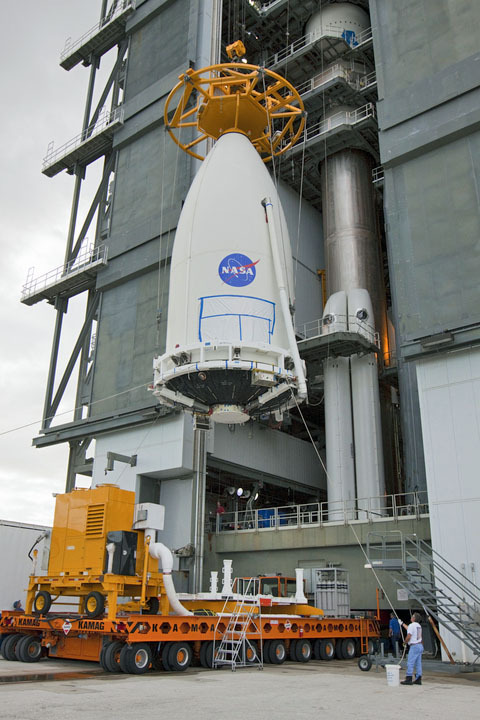 An overhead, heavy-duty crane lifted the craft through the doorway and positioned it atop the Centaur for mating. The completed rocket, standing 197 feet tall, will be moved to the Complex 41 launch pad the morning of Friday, Nov. 18 to begin final pre-flight preparations. The RP-1 kerosene fuel gets loaded into the first stage that afternoon. The launch countdown on Nov. 19 will last about seven hours, with cryogenic fueling operations starting about two hours before liftoff. 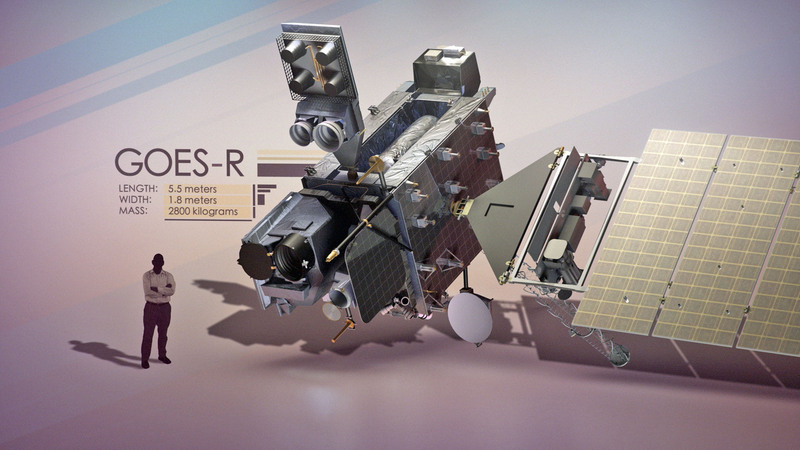 NASA’s Launch Services Program is managing the launch, and the space agency was responsible for the design and construction of the GOES-R satellite series through its partnership with NOAA. It will be the 67th Atlas 5 rocket flight and the milestone-achieving 100th for an Evolved Expendable Launch Vehicle. The nation created the EELV program to carry out critical launches like GOES-R.
“This remarkable spacecraft and the instruments it holds embody what NOAA and the aviation, aerospace, and private weather enterprises have been conceptualizing for years,” said NOAA Administrator Kathryn Sullivan, a former astronaut and first American woman to walk in space.